Bangalore, now called Bengaluru, is the capital city of Karnataka in south India. The city has earned several names such as Silicon Valley of India, Pub Capital of India, Air Conditioned City, and City of Gardens. Prior to the IT revolution, Bangalore was known as Pensioners' Paradise. Now, it's a wonderful blend of past and present. Although Bangalore may not have as many iconic attractions as other major cities in India, it does have a great mix of history, architecture, culture, spirituality, and nature. Here are the top tourist places to visit in Bangalore. Consider seeing many of the city's attractions on a Bangalore walking tour. Alternatively, Viator in conjunction with Tripadvisor offers a comprehensive Private Full Day Bangalore City Tour and Experiential Culture Tour of Bangalore, bookable online. Built in 1887 by Chamaraja Wodeyar, Bangalore Palace is inspired by England's Windsor Castle. This evocative palace has Tudor-style architecture, with fortified towers, arches, green lawns, and elegant woodcarvings in its interiors. The royal family still lives there. On display are all kinds of memorabilia, family photos, and portraits. The palace is open from 10 a.m. until 5.30 p.m. If you're an art lover, don't miss visiting the National Gallery of Modern Art on Palace Road. This gallery, which opened in 2009, is the third such one in India (the others are in Delhi and Mumbai). It's housed in a Colonial mansion with a garden setting and has two interconnected wings. The old are features works from the early 18th century up until India's Independence, while the new one displays works from a large number of modern and contemporary artists. There's a cafe on the premises as well. The gallery is open daily, ​except Monday, from 10 a.m until 5 p.m. Situated inside the Bangalore Fort area, Tipu Sultan's Palace was originally built by Chikkadeva Raya in mud. Later, Hyder Ali started reconstruction in Indo-Islamic architecture. This was completed by his son, Tipu Sultan, in 1791. The Hindu temple seen in the courtyard of the fort is the proof of Tipu Sultan's religious tolerance. The palace is open daily from 8.30 a.m. until 5.30 p.m. Combine visiting it with nearby Krishna Rajendra Market. This vivid, traditional local market is an assault on the senses and a treat for photographers. 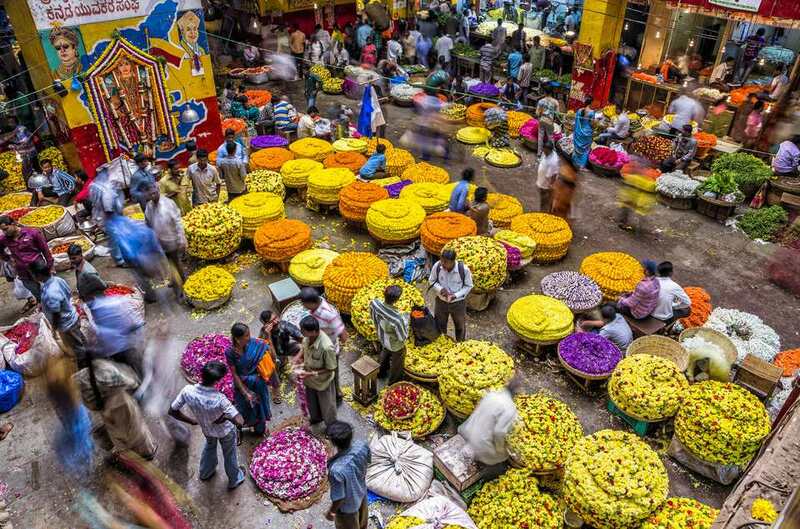 In the middle of it is Bangalore's bustling flower market. Go there in the early morning to best experience the colors and crowds, when piles of fresh stock are being unloaded and sold. The market also sells a variety of fresh produce, spices, and copper items. This expansive garden started out as a private Mughal-style garden for the city's royal rulers. It was established in 1760 by Hyder Ali and later extended by his son Tipu Sultan. It now covers 240 acres, and derives its name from the red roses that bloom throughout the year there. The garden is said to have the most diverse species of plants in the world. Its focal point is a majestic glasshouse, built in 1889 to commemorate the visit of the Prince of Wales. It was designed along the lines of the Crystal Palace in London. The garden is open from 6.00 a.m. to 7.00 p.m. throughout the year. It takes on a festive look during India's Independence Day and Republic Day celebrations, with a captivating show of over 200 varieties of flowers. The show also features an exhibition of hybrid vegetables. Occupying a 300-acre area in Bangalore's business district, Cubbon Park is a popular place for walkers, joggers, nature lovers, and anyone who just wants to laze around. The park was named after the erstwhile Commissioner of Bangalore, Sir Mark Cubbon. Many ornamental and flowering trees, both exotic and indigenous, can be found there. Kids will enjoy the special Bal Bhavan play area and aquarium inside the park. Built in 1954, Vidana Soudha is a landmark of Bangalore, next to Cubbon Park. This enormous building is a massive example of neo-Dravidian architecture, with four domes on its four corners. It houses the Legislative Chamber of Karnataka Government, as well as accommodates many government departments. Unfortunately, it's not open to the public but is stunningly illuminated at night. Close to the Court is the red, Gothic-style State Central Library building, with imposing stone and fluted pillars. Nearby, the highlight at the Government Museum is a collection of artifacts and stone carvings dating back to the 12th century, and excavated from places including Hampi. Adjacent to the Museum is Venkatappa Art Gallery, devoted to displaying famous paintings, plaster of Paris works and wooden sculptures of renowned artist Venkatappa (who painted for the royal family). Tickets for the museum also provide entry to the art gallery. Picturesque Ulsoor Lake is spread over an area of 125 acres in the heart of the city, north of M.G. Road. It was constructed by Kempegowda II. It's open daily, except Wednesdays, from 6 a.m. until 8 p.m. Boating facilities are provided by the Karnataka State Tourism Development Corporation. There's also a walking track around the lake. Bangalore is the home of many of India's spiritual gurus, and the city has a rich religious culture. There are many diverse places of worship, including ashrams, mosques, and churches. It's also worth exploring the area around Bangalore. There are many places of interest, whether you're after an escape from city life or are a visitor who wants to spend a day enjoying the abundant beauty of Mother Nature.